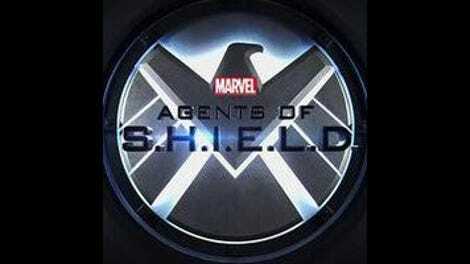 It’s almost surprising it took this long for Agents Of S.H.I.E.L.D. to get an episode where half the team can’t see the other half. The “We can see them, but they can’t see us” conceit is a sci-fi staple, in everything from The Twilight Zone to Star Trek to more than a few holiday lessons learned. (Scrooged’s take on A Christmas Carol is a personal favorite.) But the real fun here was in watching scenes play out in the contrasting versions of reality created by Coulson, Fitz, and Robbie getting hit by the blast from Eli’s machine. And to top it all off, there was an additional passenger along on that ride, one who didn’t care much for being slowly dragged down to hell. When Mack first hopped on the motorcycle, punched out the S.H.I.E.L.D. staffer, and rode away in direct violation of Mace’s orders, it felt wildly out of character. So when it was revealed what had happened, the excitement was twofold—Ghost Rider wasn’t about to just let himself be sucked back down, and Mack was now in possession of—or rather, being possessed by—the spirit of vengeance. Ghost Rider jumping into Mack’s body made for a thrilling twist in an episode already infused with an appealing hook, and while I would’ve liked to have seen what happened had Mack retained the Ghost Rider persona, the team-up between Robbie and him next week should help compensate for that missed opportunity. Gabriel Luna has really stepped up his performance, and for the first time all season, he almost felt like a part of the team. (Being blasted into an unstable reality that slowly pulls you into hell seems like good incentive to join the crew, to be fair.) His confrontation with his normally demonic alter ego also showed just why Robbie was a prime candidate for the spirit in the first place. “We had a deal…settle my score, and I’ll settle yours,” he reminds Ghost Rider, when the being tries to claim all the victims already killed are the end of their arrangement. Meaning, even if they succeed in bringing down Eli, Robbie’s work isn’t finished. “Deals With Our Devils” outpaced any other installment so far this season by smartly foregrounding the emotional stakes for all of the team throughout this crisis. And among the pathos on display, none were so ragged and frenetic as Fitz’s angry frustration over his inability to let Jemma know he was trying to get back to her. 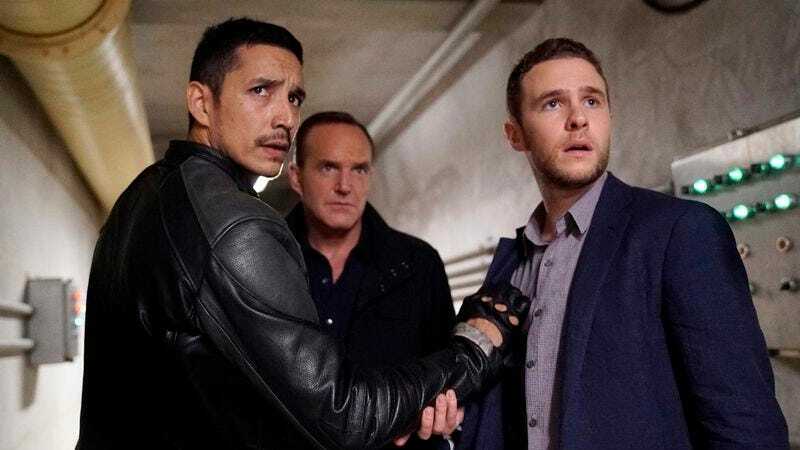 While his lashing out at Coulson was sidelined and chalked up to the rage he felt over not being able to communicate with Simmons, there was genuine anger at his former director for hanging up the mantle of authority to someone who the team doesn’t trust. Coulson stepped down for a director who “betrayed Simmons,” Fitz sputters, his frustration with his old boss tangled irrevocably with his panic at the current situation. Going forward, Phil will have more than just his own feelings of uncertainty about giving up control of S.H.I.E.L.D. when the subject arises. He may have thought it was for the best, but his team clearly doesn’t. But Coulson had his own emotional drama tonight, as Melinda May violated every warning about the Darkhold in her effort to bring him back. He witnesses her conversation with herself, trying to battle the knot in her stomach suggesting Coulson and the others aren’t coming back. Daisy was right about the situation, but May is far too hard-bitten a realist to not allow the possibility Coulson is gone. But then, she remembers the book, and all bets are off. There’s an even deeper well of connection there than we assumed. I don’t know if the show is teasing a romantic relationship developing between them, but the intensity of their feelings can’t be denied. Especially not after Aida triggers the doorway between the two dimensions, and Coulson, losing his struggle to remain in this reality, sees and hears May calling to him. That moment of awareness triggers something in him, and he pulls himself back up and through the gate. He cares about his whole crew, but May is the one who saved him, no matter how much everyone else helped. Daisy, after all that’s happened, still can’t bring herself to admit that her place is here alongside her teammates. True, she’s still technically a wanted fugitive, but aligning with S.H.I.E.L.D. is a smarter move in the long run than continuing to try and live off the grid. And when Mack goes AWOL, she steals Robbie’s car without a second thought. (Unless you count “Never tell your brother about this next part” as a separate idea.) When she heads off at the end, the pause conveys far more than her actions—she wants to be here, with her family, and she knows it. She just can’t admit it yet. Aida, Aida, Aida. The android saves the day, but at the cost of imperiling everyone going forward. The secrets of the Darkhold are now contained in her android brain, and she’s already busily fashioning herself some sort of brain-shaped creation using her newfound powers. It’s been barely more than a year since the events of Avengers: Age Of Ultron, but by all indications, another A.I. creation tasked with saving lives is about to exceed its programming, this time in the small-screen arena of the MCU. Next week looks to be the showdown with Eli and his new something-from-nothing powers (that get put to stabbing use almost immediately), but we’re already busy being prepped for our next big threats. Senator Nadeer may think she’s tough, and whatever powers have been given her brother (we’re assuming that’s who was inside the Terrigenic cocoon that Jemma broke through, yes?) will undoubtedly play a role in what happens next, but frankly, an android with the powers of the Darkhold, assuming it knows what’s best for us? A little more concerning. Speaking of the Darkhold: That book still looks stupid. There’s no way spending seven months stuck in a Terrigenic cocoon doesn’t make you a little unstable. Then again, maybe he just overheard some of whatever his sister’s people are planning to do to him. “Dude. What?” Robbie, just saying what most are usually thinking when Fitz launches into tech-speak. Poor Nathanson. He helped carry May out of the lab, and she doesn’t even know his name. A great shot tonight, when Aida is building the gateway and the camera rotates around the machine, first showing Fitz and Coulson’s perspective and then shifting to the others’. Minor quibble: The show’s colors still don’t pop enough. It should be more distinct if you’re going to darken an entire version of each scene. Looks like we were right: Doctor Strange didn’t have an impact on this episode, despite the monthlong break since the last one. Sorry, fans of Stephen Strange—no shout-outs from Agents Of S.H.I.E.L.D.